BEIT SAHOUR, West Bank (CNS) — Bethlehem and the neighboring towns of Beit Jala and Beit Sahour depend economically on tourism, but traditionally have struggled with keeping visitors in the area for more than half a day. Although the hotels are fully booked for Christmas this year, that does not necessarily mean it will translate into any business for the locals. Most large tour and pilgrim groups are bused through the Israeli checkpoint straight to the Church of the Nativity and sometimes to the nearby Milk Grotto or Shepherds Field in Beit Sahour. Then tourists get back on their buses and go to one of a select few souvenir shops to spend their money. If the souvenir hawkers hovering in the area are lucky, they may be able to sell the tourists a few trinkets during their brief stay. But for the most part smaller businesses, including shops and cafes, rarely see any rainfall from visitors. With the memories of the economic difficulties during the second intifada still fresh in their memories, private residents and the three municipalities are starting initiatives to entice visitors to stop, stroll through the towns, eat a local baklava sweet or take a city tour, much like they would in any other city they visit. Janneke Stegeman, 38, a Dutch theologian, has been to Bethlehem many times. 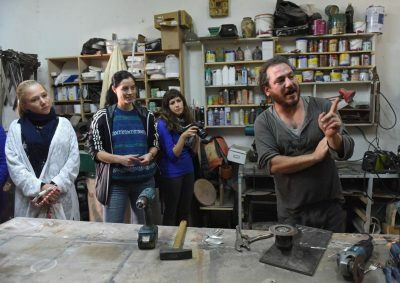 But this time, arriving during the Christmas season, she took advantage of a two-hour Art Walk tour through the old city of Beit Sahour — one of Bethlehem’s sister towns in the Bethlehem “triangle” — to get to know some of the young artists in the area and hear about the work they are doing. Just having a cup of coffee at a place like Singer Cafe affords a glimpse into the life of young Palestinians who opt to stay in their city and invigorate their town rather than emigrate, she said, sipping her coffee as she spoke. “It is important for me that people understand that Palestinians deserve as much time as Israel. There is nothing to be afraid of if they come here. Come, see the Nativity Church, but then come meet the local Palestinians, have a chat with them. People come to see the Biblical stones and then forget to see the living stones,” she said. Dutch expat Kristel Elayyan, 40, who runs the Singer Cafe with her husband, Tariq, started the Art Walk, so people get to know local artisans. Social media is also taking a role in advertising the events and stirring up interest for both local and international visitors. The Bethlehem Christmas tree was lit to the delight of a crowd of thousands in Nativity Square, with live music and fireworks following. Similar tree-lightings took place a few days later in Beit Jala and Beit Sahour. The Latin Patriarchate tweeted about the tree-lighting event in Bethlehem, and the municipal Facebook pages advertise in English the various events taking place in the area during the season: the Art Walk, Christmas markets featuring locally produced crafts and food, an Afro-Dabkeh dance workshop, a pre-Christmas gala dinner, a pub dance party and a Christmas “Santa Run” in Beit Jala, where St. Nicholas is the patron saint. 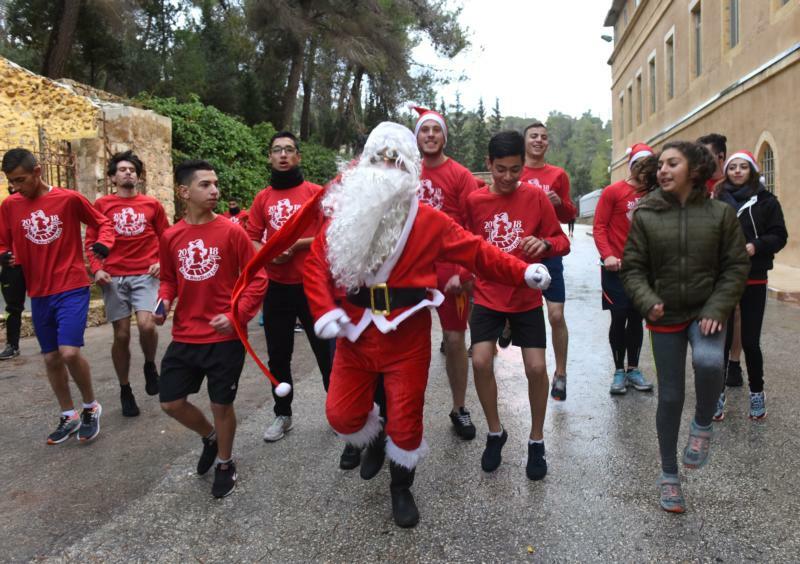 As rain drizzled, participants in the Santa Run gathered in the parking lot of the Beit Jala Latin seminary Dec. 7, stretching their muscles, buying their red Santa shirts and taking selfies as they waited for the shuttle to take them to the Cremisan Monastery, where the run began. A representative from the Beit Jala municipality who declined to give his name told CNS: “Our vision is of strengthening the cultural side of Beit Jala. We want to note the connection between St. Nicholas and Santa Claus. It is about promoting tourism, and bringing it up to the international level is our dream,” he said as upbeat Christmas carols blared in English from a car with oversized loudspeakers. In the end, some 80 locals and a few internationals took part in the run — some came just for the fun while others came intent on winning. The Santa Run Facebook page was updated continuously throughout the event.